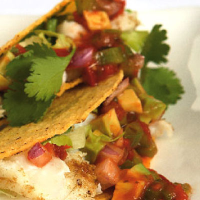 These crisp tacos with spicy fish and a jaunty salsa make a fresh, light supper. Preheat the oven to 180°C, gas mark 4. To make the salsa, dice the avocado, pepper and jalapenos. Toss these with the chilli salsa, onion, lime juice and coriander, reserving a few leaves. Stack the taco shells upright in a baking dish; heat for 5 minutes. Dust the fish with cumin and season. Heat the oil in a non-stick pan and cook the fish for 2–3 minutes on each side, until just cooked. Break into small pieces. Fill each shell with lettuce, top with the fish and spoon over the salsa. Scatter over the reserved coriander. The Corker recommends - A chardonnay has enough richness to tickle along the tacos.